Highsiding - Mundaca, Futaleufu River, Chile. Highsiding – Mundaca, Futaleufu River, Chile. I got an email today from someone asking about the term ‘highside’, I mentioned in yesterday’s post. This photo shows a guide pulling a classic ‘highside’, alas, to no avail. His raft flipped moments later. The guide, nearest the camera with the blue helmet, is diving to the high side of the raft. If his crew had done the same, instead of falling out to the left, the boat may not have flipped – though I suspect it was going to regardless. You can see why folks wear a helmet on the Futaleufu. The poor soul in front of the guide, Brent, got smunched before the boat even flipped. 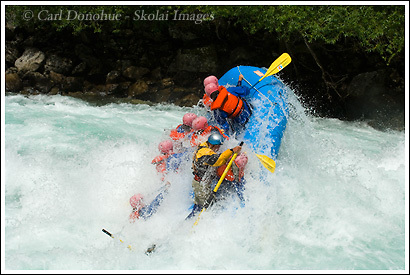 This is another shot from Mundaca, possibly the classic rapid on the Futaleufu. It’s not the biggest, which is why it’s so cool. Some of the bigger rapids are ‘Terminator’, ‘Throne Room’ and ‘Casa de Piedra’, among a few others. But they’re SO big guides generally have to play it safe – Terminator is at least a 1/4 mile long of solid whitewater, Throne Room is even bigger, and Zeta is a narrow slot canyon full of nasty undercuts and holes that keep bodies a long time – most commercial trips walk Zeta unless the water level is way down. I promised myself I’d get to bed earlier tonight, but I got to watching the film “Crash” again, and here it is kinda late. What an awesome film. On another side note, anybody notice anything else new about the ole blog today? This entry was posted in Adventures, Chile, People, Rafting, Travel on December 24, 2007 by Carl D.